Boy, am I impressed! I knew before we bought our 2007 GMC Yukon XL Denali that one of the things that I would miss would be Honda's excellent implementation of the factory navigation system. However, I discovered that even though some system features are lacking, GM goes leaps and bounds ahead of Honda in terms of customer support. The navigation disc that came with our vehicle was from 2005 (Version 1.10, Part #15807780) and quite old with many roads and POIs missing or incomplete. Using the GM Nav Disc Center website, I discovered that there was a 2008 update available. When I entered my VIN to place an order I found out that it didn't work! ...and everything was corrected and updated in a professional and efficient manner. On top of that, they are sending me the new updated navigation disc for free! 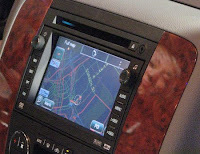 GM offers a subscription program that gives owners of all new North American 2006 and 2007 model year GM vehicles (excluding Saab) with factory installed navigation systems two free update discs for the navigation system on the first and second anniversaries. I'm really pleased because Honda charges its owners $185 USD for each and every update. This feature of Honda is really great. and this is very helpful in driving. Thanks for sharing the nice post.